And here we at, at the end of the Doctor Who Monster Collection series of books. It has certainly been a fun little adventure seeing different aspects of the Doctor Who Universe with the help of various Doctors, Companions and of course aliens, monsters and such. And has been quite the worthwhile literary journey. 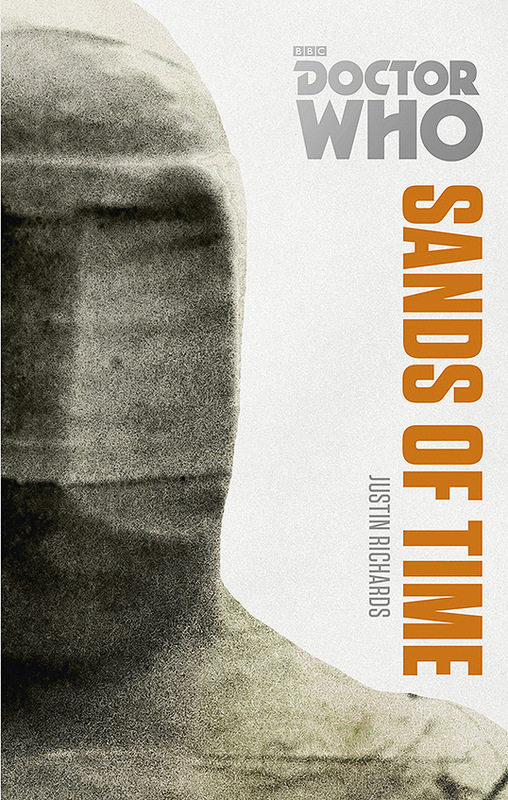 Doctor Who: Sands of Time is the last of the re-released book in this series featuring the Osiran mummies featured in the classic episode, "Pyramids of Mars". And while they're not necessarily some of the most prolific Doctor Who antagonists in the history of the show, they certainly have a rather rich back story and some pretty compelling motivations. Of all the different Monster Collection books that I've read so far, I was most impressed with how this one had been crafted. As much as Doctor Who has a time traveler as its protagonist, it's not common for stories to be all complicated because of so much back and forth time travel moments. Time travel has mostly just been a way to get to where the adventure might be (whether past, present, or future) and not necessarily integral to the plot itself. But this story was rather different in that regard, and the final execution was pretty impressive. Synopsis: Doctor Who: Sands of Time is a Virgin Missing Adventures novel originally released in 1996 and re-released as part of the Doctor Who: Monster Collection of books in 2014. It was written by Justin Richards and features the Fifth Doctor and his companions Nyssa and Tegan. The adventure begins with the TARDIS bringing the Doctor, Nyssa and Tegan to the British Museum during Victorian London well into the night. And things get complicated soon enough as mysterious figures that had been hiding in the museum manage to kidnap Nyssa and then send her back in time to ancient Egypt. As the Doctor and Tegan look for their friend, they're approached by Atkins, the butler of Lord Kenilworth with a formal invitation to a mummy unwrapping. They follow Atkins and are surprised to discover that he seems to be familiar with both of them and that they already had rooms booked for them at a nearby hotel. Things get stranger still once they meet Lord Kenilworth, who acts as if he had known them very well for quite some time. The crux of the whole mystery is eventually revealed when they finally unwrap the mummy that Kenilworth had manage to retrieve - and this is because the mummy turns out to be Nyssa! If you bother to take the time to read the little introduction that the author had written for this re-release of the book, you'll discover fascinating little bit about how this story came to be and the sort of work that the author put into getting his timeline straight. And that's pretty key when you have a Doctor Who story that begins out of sequence and with various events having taken place outside of the knowledge of the reader (and in this case, the Doctor). But the story is beautifully written in a manner that makes perfect sense once you get to the end of things. But it can get rather confusing at times since the Doctor seems to have been rather busy behind the scenes as he sets things up...for himself. And while the current Doctor Who series is pretty adamant that the Doctor can't necessarily cross his own timeline, I think the way that they timed things here was just about right. The Doctor never directly encounters himself, but they certainly time things so that everything happens as it should. I also appreciated how the book touched on the death of Adric since the story takes place sometime after that adventure. His death was definitely one of the key moments in the Fifth Doctor's history and the TV show was pretty clear on depicting how much it affected him in the long term. This book follows that tone and ties it into events well enough. After all, the key plot thread revolves around Nyssa being kidnapped, and thus we have the Doctor risking the loss of another Companion so soon after Adric. I really enjoyed this book for both its complex plot and the interesting interactions between the different characters. And admittedly the final goal that the antagonists had in mind wasn't immediately apparently until the end, and that takes a fair amount of work to achieve. And this was quite the enjoyable time travel mystery beyond it being a Doctor Who book. Doctor Who: Sands of Time has a lot going for it and is one of the more clever additions to the Monster Collection of novels. And I'm certainly looking forward to continuing to explore the different Doctor Who books to come. Thus I'm happy to rate this as 5 moments of someone knowing the Doctor without him knowing who they are out of a possible 5.